Oral ulceration is probably the commonest oral mucosal disease seen and it may also be the most serious. It is important therefore not to underestimate that ulcer in your mouth, especially if it persists for a long time. What are the common causes of recurrent oral ulceration? Erythema multiforme – this is a group of signs and symptoms of multi-factorial etiology with the minor form affecting only mouth with target lesions on the skin or major form with variable skin involvement. The most severe form is known as Stevens-Johnson syndrome. How do you differentiate between these conditions? Diagnosis is almost entirely on the basis of findings in the history. Some features of the examination, blood tests or a biopsy may be helpful in certain cases, but the history is most important. How long has the ulcer been present? If a mouth ulcer has been present in the mouth for more than 3 weeks, referral for appropriate specialist investigations, including biopsy is mandatory. 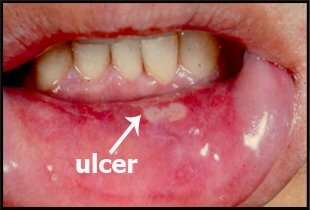 If the ulcer is of recent onset, ask yourself whether it was preceded by blistering, are the ulcers multiple? Is any part of the body affected and have similar ulcers been experienced before? Minor aphthous ulcer (RAS) ulcers heal in approximately 10 days. Herpetiform ulcers may heal in about the same time or sometimes a shorter period. Major RAS lesions may fail to heal for weeks or even months. Erythema multiforme is variable depending on severity and heals in 10 to 21 days. Traumatic ulcers heal as soon as the causative factor is removed. Was blistering present before the ulcer? 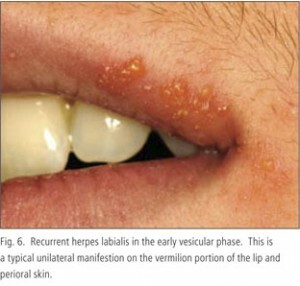 Blistering preceding the ulcer in mouth suggests a possible viral infection or vesiculo-bullous condition such as herpetic gingivostomatitis caused by Herpes simplex virus, the most common viral infection affecting the mouth. This fact may be helpful in the differential diagnosis of herpetifom ulcers which resembles viral ulcers but are not preceded by vesicles. Blistering with lesions elsewhere in the body suggests erythema multiforme or hand, foot and mouth disease (caused by Coxsackie virus and is also confined to children). Where is the ulcer(s) located? Distribution of the ulcer(s) can help in the differential diagnosis. If limited to the gums, necrotizing ulcerative gingivitis (NUG) may be the problem. Trench mouth disease, or acute necrotizing ulcerative gingivitis (ANUG) in medical term, is a condition that affects the gums which as its name implies; destroy gum tissues, create sores and inflame the gums. Unilateral distribution (presence on one side of the face) suggests shingles, caused by Varicella zoster virus which causes chickenpox as a primary infection and shingles as a reactivation. If the ulcer is found under a denture or other appliance, traumatic ulceration may be the cause. Recurrent traumatic ulceration usually recurs at the same site, often close to a sharp tooth. Recurrent aphthous stomatitis (RAS) almost exclusively affects non-keratinized mucosa. Erythema multiforme affects predominantly the vermillion border of lip, cheek mucosa and anterior mouth. The presence or absence of pain is not particularly useful diagnostically although the character of the pain may be of value. Pain is often a late feature of oral carcinoma or mouth cancer and the fact that an ulcer may be painless never excludes it from being a potential oral cancer ulcer. For most ulcers of recent onset, and a few present for an indeterminate period, a trial of therapy is often a useful adjunct to diagnosis. This is especially useful in recurrent aphthous stomatitis (RAS), viral conditions (where ulcer treatment is essentially symptomatic) and lesions probably caused by local trauma with oral ulcer treatment being removal of the source of trauma and review after 1 week. Which ulcers should one be wary of? Oral squamous cell carcinoma for obvious reasons.